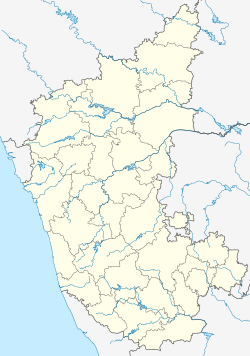 Bangalore Inglis pronunciation: /ˈbæŋɡəlɔər, bæŋɡəˈlɔər/, offeecially Bengaluru (Kannada: ಬೆಂಗಳೂರು, Bengaḷūru ? [ˈbeŋɡəɭuːru] ( listen)) is the caipital o the Indie state o Karnataka. Bangalore is nicknamed the Garden Ceety an wis ance cried a pensioner's paradise. Locatit on the Deccan Plateau in the sooth-eastren pairt o Karnataka, Bangalore is Indie's third maist populous ceety an fift-maist populous urban agglomeration. In 2009, Bangalore wis inductit in the leet o global ceeties an ranked as a "Beta World City" alangside ceeties sic as Dallas, Miami, Boston, Kuwait Ceety, Lima, Brasilia an Munich in the studies performed bi the Globalization and World Cities Study Group and Network in 2008. The day as a lairge ceety an growin metropolis, Bangalore is hame tae mony o the maist well-recognised colleges an research intitutions in Indie. Numerous public sector hivy industries, software companies, aerospace, telecommunications, an defence organisations are locatit in the ceety. Bangalore is kent as gairden ceety acause o its bonnie gardens. Bangalore is an aa kent as the Silicon Valley o Indie acause o its poseetion as the naition's leadin IT exporter. A demographically diverse ceety, Bangalore is a major economic an cultural hub an the seicont fastest growin major metropolis in Indie. ↑ "Commissioner - BBMP". Bruhat Bengaluru Mahanagara Palike. Retrieved 5 October 2012. ↑ Ramachandra T. V.; Uttam Kumar (Jan 2010). "Greater Bangalore: Emerging Urban Heat Island". GIS Development. Retrieved 25 January 2012. ↑ "Urban Agglomerations/Cities having population 1 lakh and above" (PDF). Censusindia. The Registrar General & Census Commissioner, India. Retrieved 17 October 2011. ↑ D. V. Kumar (2006). Modernisation and ethnicity: locating the Telugu community in Bangalore. Mittal Publications. p. 16. ISBN 8183241077, ISBN 9788183241076. ↑ "Bangalore – It is life in rush hour". The Tribune - Tribuneindia.com. 2007-01-13. Retrieved 2011-01-26. ↑ "India: largest cities and towns and statistics of their population". World Gazetteer. Archived frae the oreeginal on 2012-02-09. ↑ "GAWC World Cities Ranking List". Diserio.com. Retrieved 2010-05-05. ↑ "Bangalore: Growth Opportunities in the Silicon Valley of India". Internationalisation Advisory. Retrieved 2009-08-20. ↑ "Location Roadmap for IT-BPO Growth" (PDF). NASSCOM. Retrieved 2009-08-20. ↑ "Karnataka IT exports up by 52%". SiliconIndia.com. Retrieved 2009-08-20. ↑ "India's 10 fastest growing cities". Rediff News. 2008-02-06. Retrieved 2009-04-07. ↑ "The official visit of the Republic of Belarus parliamentary delegation to the Republic of India is over". Website of the Naitional Assembly o Belaroushie. Retrieved 2008-03-10. ↑ Bangalore, San Francisco are sister cities. The Hindu. 11 May 2007. Wikimedia Commons haes media relatit tae Bangalore. This page wis last eeditit on 10 Mairch 2018, at 20:27.